Junior Sanaa' St. Andre, while new to RBHS, has given the Bruins a new look while bringing both speed and a defensive edge to the team. St. Andre was able to help hold the Kewpies to minimal fast breaks, helping lead RBHS to the victory. Junior Biance Stocks returns off the bench and puts up three points for the Bruins. "Luckily we went into halftime and I was able to take a break and help my team again," said Stocks as she discussed how her injury impacted her performance. 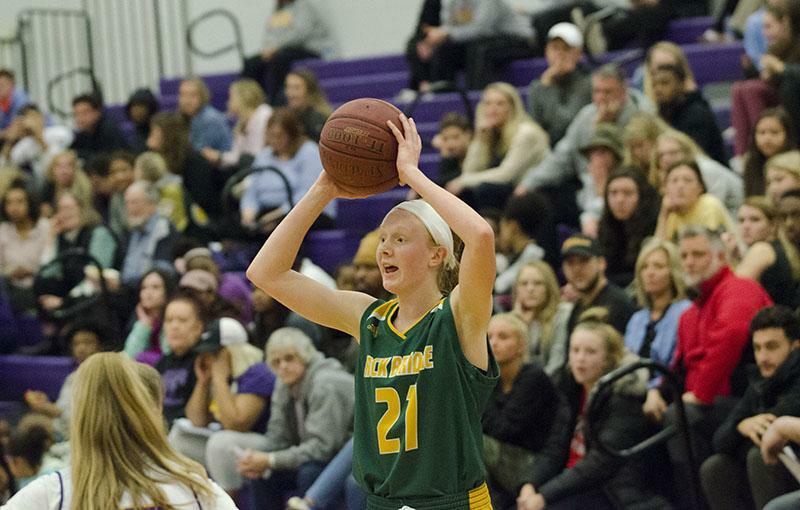 Frehsmen Averi Kroenke stepped up this year to take a starting varsity position and has continued to show that she deserves the spot. Kroenke was a huge offensive piece for the team, not just in scoring, but by moving the ball around in order to keep HHS on their toes. Last night the girls basketball team traveled across town to take on Hickman High school (HHS). Despite the scheduled 7:00 p.m. start time, the varsity game didn’t begin until 7:35, due to the JV game taking longer than expected. HHS would win the first possession of the ball as the tip off led the game to begin. Through the first quarter the lead bounced back and forth between the two teams keeping energy high on the court. Tensions were intensified with such an important game on the line and it showed. With RBHS having battled through a couple of rough seasons following the infamous “four-peat” stretch, proving that they were once again the top team in Columbia was critical. Both teams were willing to sacrifice anything to take the lead. In the second quarter, junior Biance Stocks was taken out of the game do to a head injury she received while going after a rebound. The effect of her absence was measurable, as the lead that RBHS was beginning to take was soon knocked down. Stocks had been a key scoring component to their offense and with her recovering, RBHS’ lead was no longer. As the first half of the game ended the score was still tight and Stocks had yet to re-appear from the bench. When halftime rolled around, the score was in favor of the Bruins. During the break both cheer team from HHS and RBHS gave a quick performance in front of the audience and HHS’ dance team performed as well. The noise from the crowd only grew as the two teams hit the court after half time. Stocks was back in the game and playing alongside the four other starters. Junior Eryn Puett hit a couple crucial three pointers that put RBHS in the lead again. Despite the Bruins efforts HHS was once again able to come back from the deficit and keep the game exciting. Fans grew more passionate as the clock continued to tick down and foul calls were now critical to how the game was going to turn out. With the end of the third quarter now approaching the pressure to score was a challenge both teams face, senior Maddie Collier stepped up and took control of the post, scoring multiple times in the last minute of the third quarter. Leaving the Bruins, once again, with the lead as the game headed into the fourth quarter. RBHS came into the fourth quarter with a punch of energy that gave them a fair lead over their rivals. This punch would prove to be the push that RBHS needed, as the girls were able to hold the lead until the end of the game. HHS would resort to intentional fouls as the two minute mark appeared on the scoreboard. Both juniors Kailey Johnson and Maci Kuchta of HHS would pick up three fouls each as the Kewpies attempted to both stop the clock and regain possession of the ball. Although the tactic did stretch out the final 60 seconds of the game, the Bruins would walk away with a win with a score of 56-45. Camryn is a junior at Rock Bridge High school. She has had a love for photography since she can remember, she hopes to continue with her passion through high school. She also plays softball year round and has plans of playing softball in college as well.